WHAT IS GOING ON? Things are getting a little crazy. Hurricane’s Sandy aftermath is growing bleaker by the minute, and aside from that whole disaster, the presidential election is this upcoming Tuesday (which has understandably, brought this little girl to tears). I was sitting, trying to wrap my mind around it all, when I saw an alarming Facebook reminder (Facebook usually helps me wrap my mind around things, without the nuisance of talking to actual humans): daylight savings happens this Sunday. I nearly vomited on my boots. 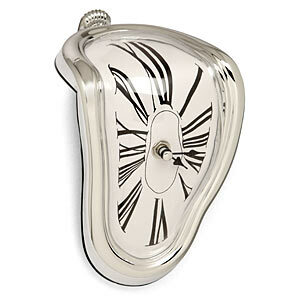 This melting clock represents my mind. Also, Roman numerals. Whaaaa? Now, I’m 25 years old. Daylight savings should come as no surprise to me, as I’ve experienced it a total of 50 times in my life. But each time I realize that it is happening, usually 24 hours beforehand, my world goes into a tailspin. How can I possibly prepare for this? I do understand that daylight savings isn’t a horrible thing. Sometimes, like this time around, we gain an hour. You know, for the farmers. But I can never remember at what point in the year we gain or lose an hour, and your silly word tricks don’t help. Fall back, spring forward…or is the other way around? Both could make sense, really. Anyway, my mind doesn’t work that way. I tend to read into symbolism and metaphors. “Fall back” to me has a negative connotation. Digression. Failure. This must be the bad one, right? We lose an hour. Wrong. We get an extra hour. Why?????!!!!! !